The root of the perennial herbaceous plant Adenophora tetraphylla (Thunb.) Fisch or A. stricta Miq. of genius Ladybell of family Campanulaceae. Cultivated in most area in Southern China. Plucked in spring and autumn. No foul smell, slightly sweet. Plump and even coarse, yellow-white color. Sweet, slightly bitter, slightly cold; lung and stomach meridians entered. Nourish yin of lung and stomach, clear heat of lung and stomach, tonify qi of spleen and lung, and dispel phlegm. It is indicated for dry cough with little phlegm, blood in phlegm, dryness in throat, and hoarseness due to lung yin deficiency with dryness-heat in lung too, because it can nourish lung yin, moisten dryness in lung and clear lung heat. 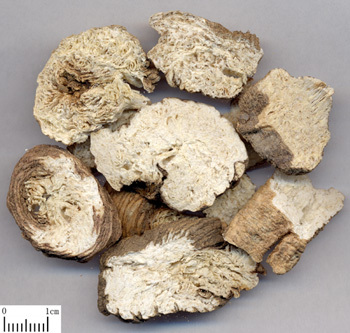 Though, it is weaker than Bei Sha Shen from the aspect of moistening dryness in lung and clearing lung heat, it can disperse phlegm and tonify lung qi, and it is very indicated for chronic cough due to yin deficiency with dryness in lung, sticky phlegm and difficulty in spitting, and both qi and yin deficiency. It is commonly combined with yin-nourishing, lung-moistening and cough-relieving herbs, such as Bei Sha Shen, Mai Dong, and Xing Ren. Or it can be combined with both qi and yin tonifying herbs, such as Xi Yang Shen, Tai Zi Shen. It is indicated for dryness in mouth and throat, dry stool or constipation, red tongue with little fluid, hunger without appetite, retching and other symptoms due to stomach yin deficiency with heat, because it can nourish stomach yin, produce fluid to check thirst, and clear stomach heat. From the aspect of stomach yin nourishing and stomach heart clearing, it is weaker than Bei Sha Shen, But, it has the action of tonifying spleen qi, so it is indicated for both stomach yin and spleen qi deficiency syndrome, especially indicated for qi and yin both deficiency with remaining heat at the later stage of heat diseases, which is contraindicated to tonifying with warm herbs. It is usually combined with stomach-yin-nourishing and stomach-heat-clearing herbs. For instance, it is used with Yu Zhu, Mai Dong and Sheng Di Huang in Yi Wei Tang from Wen Bing Tiao Bian.